Axia FX is one of the longest running and most respected financial exchange companies based in the City of London. Our challenge? To rebrand the company, design new corporate literature and develop a new, responsive website. Since its formation ten years ago Axia FX has helped thousands of personal and business clients discover an easy way of saving money on their international transactions. 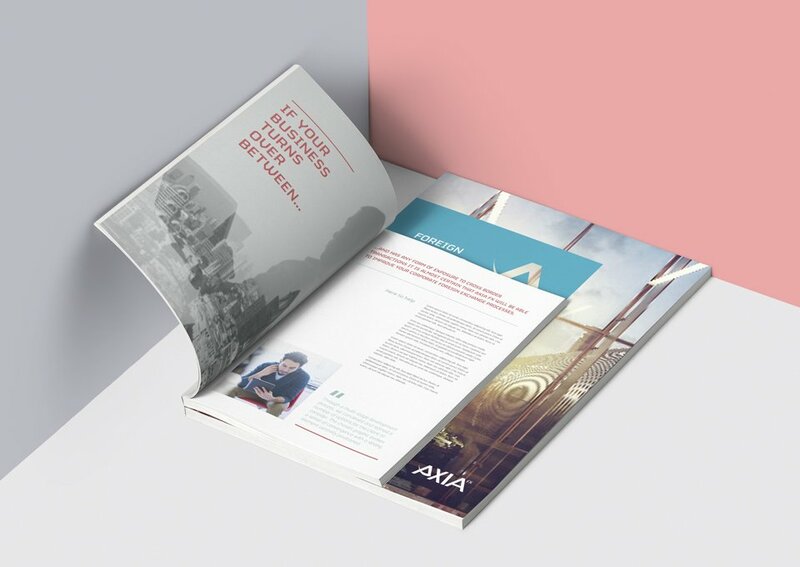 It was our aim to re-establish Axia FX at the forefront of the market, with a refreshed and updated image – standing toe to toe with their contemporaries in the financial sector. You can never have too much information at your disposal, especially for a rebrand. We learnt the ins and outs of Axia FX, their market, customer base and competitors. This helped shape the logo options. Then came the technical bit. We researched the market so that we could offer a cost-effective and easy-to-use platform for Axia FX’s new website. Concrete5 stood out as the best CMS option for our client’s needs. First, we presented Axia FX with a range of clean, clear and current logo options. The sophisticated and dynamic logos reflected the professionalism of the business - and when supported by dynamic imagery - the brand identity was captured. Next came the website. Concrete5 allows backend site editing, meaning the guys over at Axia FX are able to simply edit content and images and change colour themes on their site, as and when required. Supporting the rebrand as a whole, we created a suite of banner ads for third-party promotion, as well as press advertising and Facebook and LinkedIn presences. "Absolute has been great helping us rebrand our foreign exchange business. It’s tricky when you have what you would like in your imagination but not on paper. Absolute managed to get our needs onto paper and delivered."